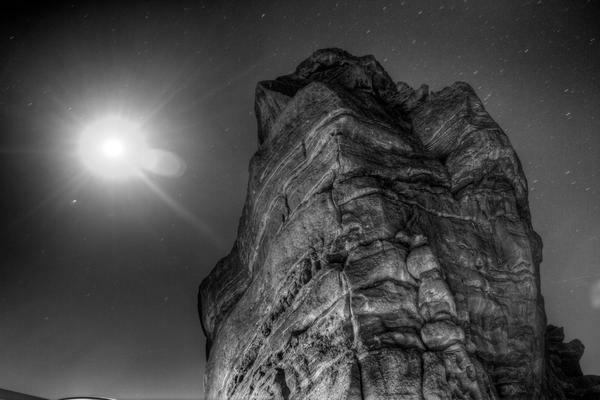 One of the large rocks juts into the sky at Red Rock Amphitheatre near Denver, Colorado on October 12, 2011. I had gone out at night to do some long exposure photography but accidentally left the one piece of equipment I needed back at home on the kitchen counter. I left the intervalometer at home which allows the camera to stay open for longer than the slowest shutter speed on the camera (30 seconds). But not giving up on a beautiful evening with a full moon I realized that 30 seconds at ISO 160 at f2.8 would produce a pretty well exposed image to create some photographs. I really like how the texture of the rock is brought out by the lights on the ground and the full moon provides an interesting countering light source. I went black and white to enhance it further. This photo is actually several exposures brought into a single photo to balance the light on the rock and some of the moon.